Running the bridge is never easy for me. The loop itself is a little over 3 miles from my house. I never run with music, for no good reason, but I did start to run with the iPhone. With RunKeeper. I like the App mostly because it’s motivational. Seeing the days pile up or the missing days adds enough reward or guilt to push me out the door on several recent 40 degree NYC mornings. I think it was 46 degrees this morning when I took the picture. The App itself is a litle buggy. A friend thinking Garmin asked for advice and my answer is, “I like it, but it takes more work than a Garmin.” In other words, you might not like it. This could be said of a lot of Apps that attempt to use the GPS functionality of the iPhone. The New York Times did a really good job with iPhone GPS apps recently. But RunKeeper customer service was pretty solid when I had a run that wouldn’t upload, which next to not getting a GPS signal are the two most frustrating experiences users seem to have. I use the free version, as I don’t run with headphones and it seems the big plus of the paid App is that it talks to you (pace, time, etc). I can live with wrinkles in the App — it’s gotten up and over the bridge and that’s pretty much a winner for me. 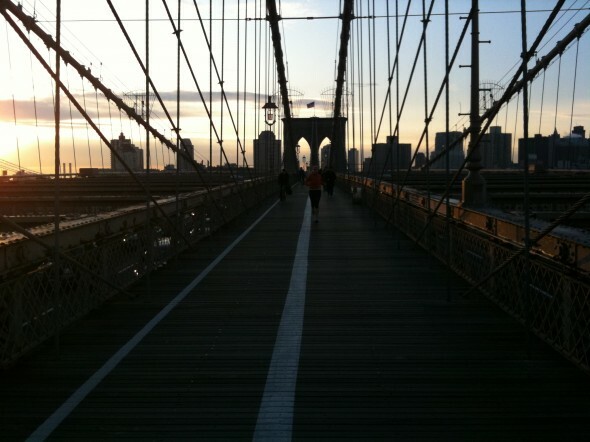 This entry was posted by John Pasmore on Tuesday, October 20th, 2009 at 9:06 pm	and is filed under Movies, New York and tagged with brooklyn bridge, iphone, runkeeper, runkeeper.com. You can follow any responses to this entry through the RSS 2.0 feed.